Rocky Mountain Power • Solar-energy enthusiasts say the proposal, offered as a way to have all users pay their share, is unfair. 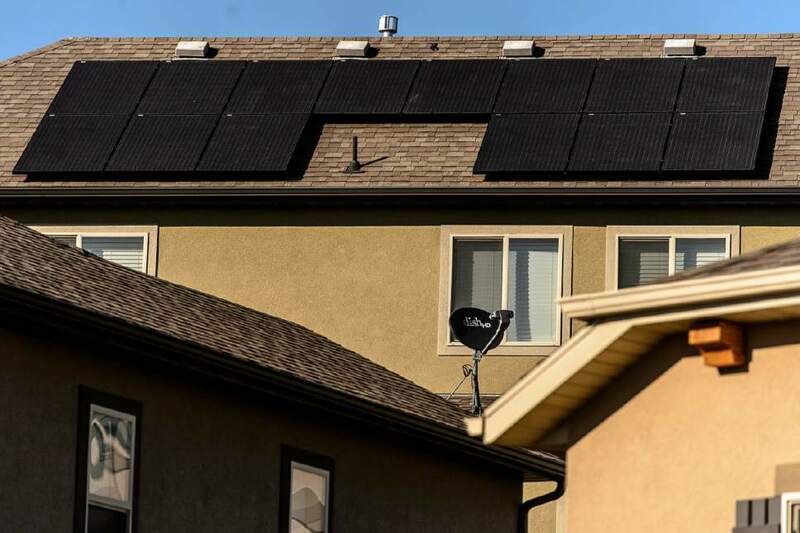 Trent Nelson | The Salt Lake Tribune Solar panels are installed on the roof of a Farmington home. Based on the first quarter, Utah is on track to have more rooftop solar installed in 2016 than in all previous years combined. Adopters say that's because, in the last few months, it has become possible to replace your entire power bill with solar panels ó and with state and federal tax credits in place for at least the next year, it still is possible to get the government to refund you almost half the cost. Solar industry leaders and advocates are gearing up to fight Rocky Mountain Power&apos;s latest proposal  a new methodology for calculating, and raising, net-metering customers&apos; electric bills. Under the new rate schedule, a typical net-metering customer  who uses 1,000 kilowatt hours per month, half generated by solar panels  would pay $74 a month, according to Rocky Mountain Power, up from the current average bill of $55 a month. A customer without solar panels who uses the same amount of power currently pays an average monthly bill of $114, according to the utility. The proposal, which the utility filed with the Utah Public Service Commission on Wednesday, would apply only to households with rooftop solar installations. These net-metering customers would pay a $15 service charge or base rate, as well as 3.81 cents per kilowatt hour of all electricity used. They&apos;d also pay a monthly "demand charge." To calculate this charge, Rocky Mountain Power would look at a household&apos;s electrical use for an entire month, find the hour in which power use peaked, and then multiply the kilowatts of power used during that single hour by $9.02. Rocky Mountain Power estimates that the average net metering customer&apos;s demand peaks at about 1.6 kilowatts. Solar customers would be credited 3.81 cents per kilowatt hour of electricity generated by their arrays. Currently, net-metering customers&apos; bills are calculated according to essentially the same rate schedule as customers who do not own their own solar panels. Customers pay a $6 service fee and buy electricity according to block rates that range from 8.5 cents to 14.5 cents per kilowatt hour. Net-metering customers are refunded for each kilowatt hour of electricity they generate themselves, which the utility says averages out to it paying 10.6 cents per kilowatt hour for customers&apos; solar power. Gary Hoogeveen, senior vice president of Rocky Mountain Power, said the utility company studied the matter and came to the conclusion that net-metering customers are an entirely different class of customer, whose bills should be calculated accordingly. As things currently stand, he said, each net-metering customer receives a $400 yearly subsidy from ratepayers who do not have rooftop solar panels. The proposed rate schedule would ensure residential net-metering customers pay their fair share. The utility is also requesting that prospective net-metering customers pay a $60 application fee, saying it&apos;s necessary to recoup the more than half a million the company has spent processing the recent influx of rooftop solar in Utah. Solar advocates worry the proposed rate structure could reverse that trend, or even stop the development of residential solar in Utah for good. "At first blush," said Ryan Evans, president of the Utah Solar Energy Association, "this appears to be the most regressive rate structure we have seen in any state. ... This would likely make it so that anyone who invests in solar would never see a return on their investment." Evans said he believed that under the proposed rate structure, net-metering customers could end up paying more for electricity than they would if they continued purchasing all their power from Rocky Mountain Power. For Rocky Mountain Power to propose such a rate structure effectively eliminates competition and prevents Utahns from improving their air quality and achieving independence in generating power, he said. Sarah Wright, executive director of Utah Clean Energy, said she too believed the proposal was the worst she had seen in any state in the U.S., save Nevada, which she said has a similar rate structure for net-metering customers. "And it dramatically hurt solar growth and development in that state," she said. Wright said she was concerned that the demand charge, which works for commercial customers, would be difficult for residential customers to understand. Commercial customers have a better idea about when their power consumption peaks, she said. But for residential customers, peak demand can be mysterious, which could discourage conservation. "Rate-making is sort of an art," she said. "You want to have rates that are fair to customers, but you also want to have rates that encourage smart behaviors." HEAL Utah also denounced Wednesday&apos;s filing, saying the proposal amounts to a bid to kill a disruptive industry that has threatened the utility&apos;s profits. Michael Shea, a policy associate for HEAL Utah, said he felt the analysis that went into Rocky Mountain Power&apos;s proposal was one-sided. It didn&apos;t take into account the benefits of rooftop solar, he said, and overestimated how much it cost the utility&apos;s ratepayers. For example, he said, household systems are more efficient than the overall grid because rooftop solar generates power where the electricity is intended to be used. Furthermore, he said, the "fuel" associated with solar generation is free and not subject to the same market variability as coal and natural gas. And studies have shown that solar power also results in environmental benefits that defray societal costs equivalent to 3 cents per kilowatt hour. "We don&apos;t think the equation is even close," Shea said. "Rooftop solar provides tremendous benefits ... and it should be encouraged, not punished." But Michele Beck, director of the Utah Office of Consumer Services, said the solar industry&apos;s concerns might fall outside the scope of the discussion within the Public Service Commission, which now must decide whether to approve Rocky Mountain Power&apos;s proposed rate structure. "The question is, is it a fair allocation of costs," not whether it&apos;s going to kill solar, she said. "I think it is empirically true that residential net-metering customers are shifting costs to regular residential customers. So I do support a change," she said. "But I&apos;m not prepared to say whether I support this change." The Public Service Commission will first have to decide whether Rocky Mountain Power is allowed to make this kind of proposal instead of initiating a larger action called a general rate case. In a general rate case, Rocky Mountain Power must present all of its costs and revenues and review its charges for all customers, not just one single class of customers. And Rocky Mountain Power requested that the commission approve the creation of a rate schedule by Dec. 10  a time line that might be too tight, Beck said. The utility set the date to draw a line between current net-metering customers, whom Rocky Mountain Power plans to grandfather into the old rate structure permanently, and new customers who would be charged according to the new rate schedule. "I&apos;m skeptical that we will be able to get it done that quickly," she said. "And I think the commission will be in favor of due process. But ... I don&apos;t know  it&apos;s an unusual filing." Details of the rate schedule would be worked out after Dec. 10, according to Rocky Mountain Power&apos;s proposal. The commission has set a Nov. 22 deadline for comments on the proposal.